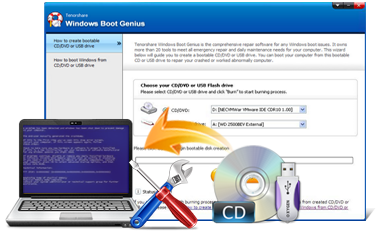 Windows Boot Genius 3.0.0.1 Free Download Latest Version For Windows Os (XP-7-8-10). Get the standalone offline installer setup file of Windows Boot Genius with a single, direct and secure download link. The downloaded setup file is compatible with both Windows 32 and 64-bit versions. The ultimate Windows boot doctor that gives you the ability to fix a lot of booting problems including computer crashes, random restarts, blue screen, can't boot, and other Windows booting issues. Windows Boot Genius is a stand-alone Windows repair toolkit that allows you to boot the non-bootable PC and fix all problems related to booting and hard disk. Windows Boot Genius 3.1.0.0 Completely offering the all-in-one solution to repair a variety of common Windows errors. It comes with a portable operating system (most people recognize it as Mini OS) that allows you to boot your computer directly (without installation) from a variety of portable media such as USB / CD / DVD drive. Windows Boot Genius can burn the bootable iso directly to the USB / CD / DVD drive without requiring third-party applications. The software integrates with a lot of utilities, allows to repair the damaged or crashed Windows system, recover forgotten password from login, recover data, clone the hard drive, fix MBR corruption and more. 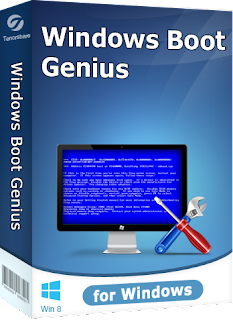 Software Name: Windows Boot Genius Free Download. Click on the button below in order to download the standalone offline setup file of Windows Boot Genius for PC both 32-bit and 64-bit OS.